From spandex, leg warmers and bright neon colours to Pac-Man and the first Apple Macintosh computer, the 1980’s brought us many iconic trends and innovations. Since old, vintage styles and designs are popping up in the current trends, whether it be in fashion, accessories, technology or even interior design and home decor, we thought we’d go through some of the coolest gadgets from the 1980’s. While the Sony Walkman was technically announced in 1979, it was a massive trend in the 80’s and just about everyone had one tucked away in their backpacks. 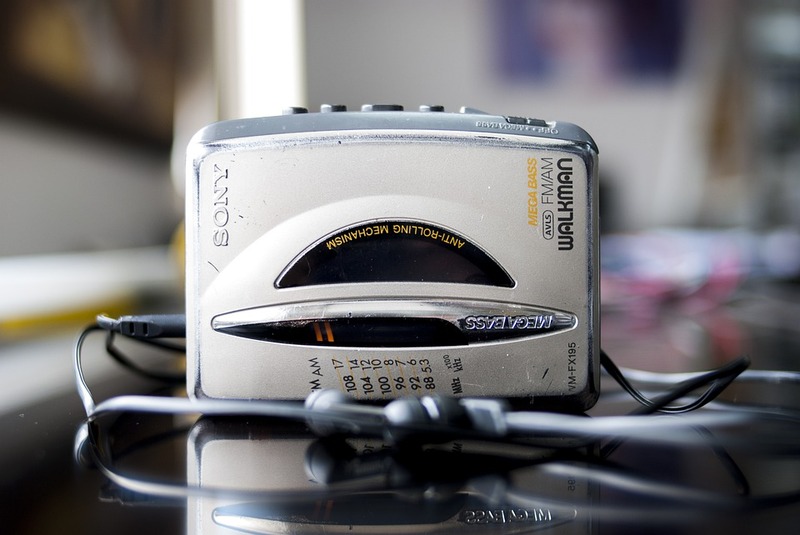 The Walkman was a portable cassette player, that revolutionized the way music was listened to. It allowed people the chance to listen to their cassette tapes where-ever they wanted and at whatever volume they wanted, which was a great technological advance at the time. One of the most memorable models was the TPS-L2, which had a dual headphone jack so that two people could enjoy the same music together. The model also featured the iconic “hotline” button that turned down the volume of the music so that you could have conversations with your friend through the internal microphone without having to take your headphones off. The Sony Discman, which was a portable CD player, was invented in 1984 and was also very popular in the 80’s. In 1982, Sony brought out the Watchman, which featured greyscale video at the time. The Watchman was a portable television device that could fit into your pocket so that you could watch TV on the go. While the original model only had a 5cm screen, later models featured larger LCD screens with colour displays. The Pocketvision 3 was another very popular portable television gadget, which was released in 1985. This device had a unique and interesting design, which utilized a white plastic panel and a mirror to project the images. In 1989, Nintendo released the Game Boy – an 8-bit handheld gaming device, which was a massive hit. While it only narrowly made being a product of the 80’s and might be better known as a 90’s product, the Game Boy is still an iconic gadget that sold millions of units worldwide. Game Boys were a great pastime to have to make train journeys or car drives more fun. The Polaroid 660 Camera was released in 1982 and was a quick and simple way for people to snap and share photos with one another. The Polaroid 660 featured a built in flash and “sonar” autofocus to help people take good photos. Instant cameras have made quite a big come back, because with everything being so digital nowadays, it’s nice to be able to produce an instant physical photograph and induces a feeling of nostalgia for anyone who lived through the 80s. The Casio Calculator watch came out in 1980 and was very popular. It featured a number of buttons for calculating and was a very useful and practical gadget. It become somewhat of a fashion trend as well as its popularity rose. People preferred it to the stylus based watch designs that were being produced at the time, because the buttons were easier to use. The Clapper is another classic 80’s gadget, which allowed people to turn the lights in their home on or off by simply clapping their hands twice. The Clapper was sound-activated and was triggered by the sound of two consecutive claps. It was a common gadget found in homes in the 80’s as it was unique technology at the time and allowed people to control their lights without even having to get up and flip a switch. While it’s not technically a gadget, we thought we’d include the Fanny Pack as an extra on this list because it was an iconic 80’s style accessory which is making a bit of a comeback in today’s trends. Fanny packs were usually made from synthetic materials, like nylon, in bright colours with bold patterns. They were stylish, practical accessories worn in everyday life and they’ve always been a popular choice for tourists and travellers as they are practical and easily accessible. Fanny Packs are coming back into fashion as teens and hipsters start to take on the accessory in different materials and styles. They are very versatile and can range from a simple, black leather design to an eye-catching holographic statement piece for an outfit. So if you have an old leather Fanny Pack that you haven’t worn in years, now’s the time to break it out. You could even add on some tassels, as leather can also be sewn with machines, to add some extra retro flare.